The European Association for Jewish Studies (EAJS) invites submissions to the EAJS Conference Grant Programme in European Jewish Studies for the academic year 2018/19, funded by the Rothschild Foundation Hanadiv Europe. As in the case of the earlier EAJS Programme in European Jewish Studies, the purpose of this programme is twofold: to foster cooperation among scholars involved in Jewish Studies across Europe, and to support early career researchers in this field to develop a professional network. Grants will be offered for two types of academic events, EAJS Conferences and EAJS Summer (or Winter) Schools. Academic excellence and the impact on network building in Jewish Studies across Europe will be key criteria; international cooperation in the development of proposals is strongly encouraged. Events need to be held within the Academic Year 2018/19 (i.e. between 1 September 2018 and 31 August 2019). Both EAJS Conferences and Summer (or Winter) Schools may be devoted to any topic of relevance in Jewish Studies, including but not limited to Jewish history, Jewish thought, Jewish languages and literatures, Jewish history of science and knowledge, Jewish material heritage, and Jewish topics in the social and political sciences. Events need to be hosted by an academic institution based in a European country. The EAJS welcomes a reflection on how the proposed theme of the Summer School as well as the interaction between faculty and participants will enhance international academic cooperation and networking. A summer school proposal needs to include a description and a justification of the theme, the faculty involved, and the duration and location of the event. It also needs to offer information about the expected non-faculty participants (e.g. undergraduate/graduate students; postdocs/early-career scholars; general public). For both formats, the applicant(s) are encouraged to invite participants from across Europe in order to allow for a broad representation of approaches and academic cultures. The EAJS welcomes applications that demonstrate a degree of public or Jewish communal impact. Successful applicants are required to produce a short academic report on the major outcomes of the event which will be posted to the EAJS website. English needs to be one, but not necessarily the only conference language. Academic associations or networks may apply for grants to cover travel or accommodation expenses for European PhD students or early career researchers participating in their meetings, or to contribute to the expenses for European keynote speakers at events and meetings held in Europe. Applicants are urged to identify and contact the relevant cost centre at their home institution (Department, Faculty, University) in order to avoid complications in the transfer of funds in case of a successful application. Also, they will need to document sufficient institutional support for holding the event and the adequate administration of funds. Eligibility: Applications are to be submitted by one or more scholars actively involved in Jewish Studies. At least one applicant needs to be a Full Member of the European Association for Jewish Studies. Active participants are not required to be members of the EAJS, however the EAJS expects that a significant proportion of the active participants will be involved in academic pursuits at European universities and academic institutions. Cooperation across Europe is strongly encouraged. The academic who will host the event will function as main applicant. They will need to document sufficient institutional support for holding the event and the adequate administration of funds. Submission process: Proposals for EAJS Conferences and Summer schools need to be submitted including full documentation (applicant(s) details: academic affiliation, short CV and selected bibliography; details of the proposed event: including a description of the theme and rationale, preliminary budget, proposed venue, and in the case of summer schools, faculty involved; details about hosting institution) through this online form (link) no later than 19 April 2018. The successful applicants will be notified by the end of May 2018. Distinguished EAJS Panel and Distinguished EAJS Graduate Student Panel. EAJS Congress, Kraków. July 2018. The EAJS invites colleagues who have submitted panels to the 11th EAJS Congress in Kraków (deadline: 15 November 2017) to also apply for recognition of their panel as a Distinguished EAJS Panel or Distinguished EAJS Graduate Student Panel (deadline: 15 January 2018). The criteria for selection are (a) academic excellence, (b) coherence of the proposed panel and (c) potential for scholarly innovation. Only panels accepted by the Congress Organising Committee will be considered. EAJS non-members may apply to this scheme as long as the proposed panel meets the conditions outlined below. Up to four Distinguished EAJS Panels and four Distinguished EAJS Graduate Student Panels will be selected, and identified as such in the printed Congress programme. Furthermore, the EAJS will waive the entire conference fee – €55.00 for EAJS Student Members, €80.00 for EAJS Full and Associate Members, €175.00 for non-members ­– for all speakers (including respondents, but excluding chairs) of the selected panels. The panel needs to be comprised of 3 or 4 speakers and up to 1 respondent. At least one speaker needs to be a fully paid up EAJS Full Member. Panel submissions comprising of early career researchers are particularly welcome. The panel needs to be comprised of 3 or 4 speakers and up to 1 respondent. A majority of the participants need to be EAJS Student Members. The application deadline is 15 January 2018. The EAJS Award Committee will request confirmation of acceptance directly from the Organising Committee of the 11th EAJS Congress. Applicants will be notified of the result of their application by 25 January 2018, providing those colleagues who need to pay conference fees sufficient time to do so. 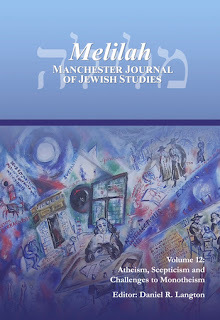 Melilah: Manchester Journal of Jewish Studies. ‘Atheism, Scepticism and Challenges to Monotheism’. Volume 12. This volume attempts to make a modest contribution to the historical study of Jewish doubt, focusing on the encounter between atheistic and sceptical modes of thought and the religion of Judaism. Along with related philosophies including philosophical materialism and scientific naturalism, atheism and scepticism are amongst the most influential intellectual trends in Western thought and society. As such, they represent too important a phenomenon to ignore in any study of religion that seeks to locate the latter within the modern world. For scholars of Judaism and the Jewish people, the issue is even more pressing in that for Jews, famously, the categories of religion and ethnicity blur so that it makes sense to speak of non-Jewish Jews many of whom have historically been indifferent or even hostile to religion. Themed volume: Atheism, Scepticism and Challenges to Monotheism. Kenneth Seeskin, From Monotheism to Scepticism and Back Again. Joshua Moss, Satire, Monotheism and Scepticism. David Ruderman, Are Jews the Only True Monotheists? Some Critical Reflections in Jewish Thought from the Renaissance to the Present. Benjamin Williams, Doubting Abraham doubting God: The Call of Abraham in the Or ha-Sekhel. Károly Dániel Dobos, Shimi the Sceptical: Sceptical Voices. in an Early Modern Jewish, Anti-Christian Polemical Drama by Matityahu Nissim Terni. Jeremy Fogel, Scepticism of Scepticism: On Mendelssohn’s Philosophy of Common Sense. Michael Miller, Kaplan and Wittgenstein: Atheism, Phenomenology and the use of language. Federico Dal Bo, Textualism and Scepticism: Post-modern Philosophy and the Theology of Text. Norman Solomon, The Attenuation of God in Modern Jewish Thought. Melissa Raphael, Idoloclasm: The First Task of Second Wave Liberal Jewish Feminism. Daniel R. Langton, Joseph Krauskopf’s Evolution and Judaism: One Reform Rabbi’s Response to Scepticism and Materialism in Nineteenth-century North America. Avner Dinur, Secular Theology as a Challenge for Jewish Atheists. Khayke Beruriah Wiegand, “Why the Geese Shrieked”: Isaac Bashevis Singer’s Work between Mysticism and Sceptics.